Options this morning for a guided bus tour of Vienna or a ‘roughing it’ tour of the city using local transport. We decided to go with the bus and then make our own way back to the ship. Once again the Viking Danube is very conveniently moored, about a five minute walk to the tube station and then four stops (maybe 7 minutes) to St Stephen’s Cathedral at the very centre of Vienna. Grand and important buildings galore along the Ringstrasse, I was impressed with our guide who talked without pause as we turned from left to right and left again. What to focus on? We could have spent several hours in St Stephen’s alone. 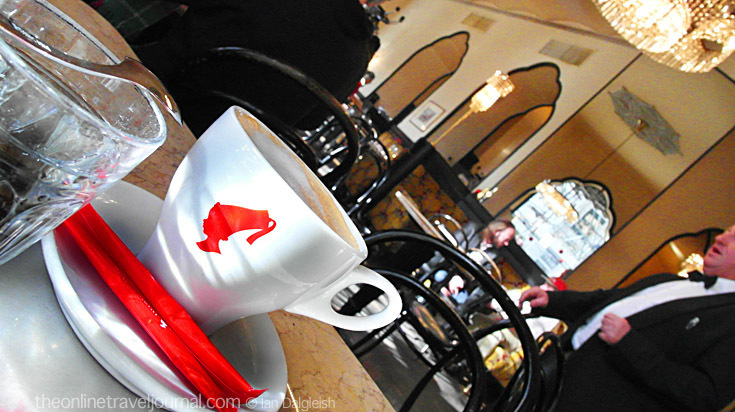 Our snapshot of Vienna; watching the Lipizzaner horses of the Spanish Riding School exercising in the elegant Winter Riding School, a melange (coffee with milk) and cake in the cosy surroundings of a traditional cafe and a stroll through newly opened Christmas Markets. Peeped out of our cabin window at around midnight as we were passing through the Slovenian capital Bratislava – magical at night with the white painted castle lit up on the hill, white lit Christmas trees and decorations all along the river bank.